One of my favorite flavor profiles that I've grown to love in adulthood (because I was a picky kid) is a good Thai curry. The warm, mildly spiced curry sauces are some of my favorites, and pair so well with almost any protein. The fact that the coconut-based creaminess lends itself so easily to a Paleo or Whole30 meal is just an added bonus! And while I continue to love & make more traditional-spiced dishes like my Thai Coconut Curry Chicken and Thai Coconut Curry Soup, taking the time to create a Thai spice blend can be consuming. Often I'll make a large batch at once, so it's ready to be sprinkled into a skillet dish or soup whenever I'm ready for some spicy-sweet Thai flavor. However, I totally understand not wanting to go out & purchase 1 million different spices just to create one blend (or to even have that many to store in your spice cabinet). For those reasons, and for the love of quick & simple meals, I decided to come up with a simplified curry. 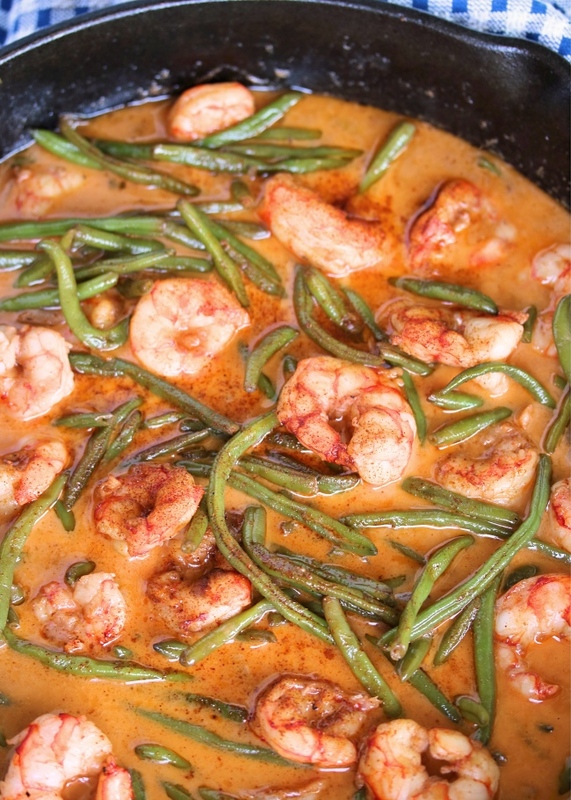 The less ingredients, the better~ but still with enough flavor to give it that traditional Thai flair. This one-dish skillet dinner was just what I aimed for! 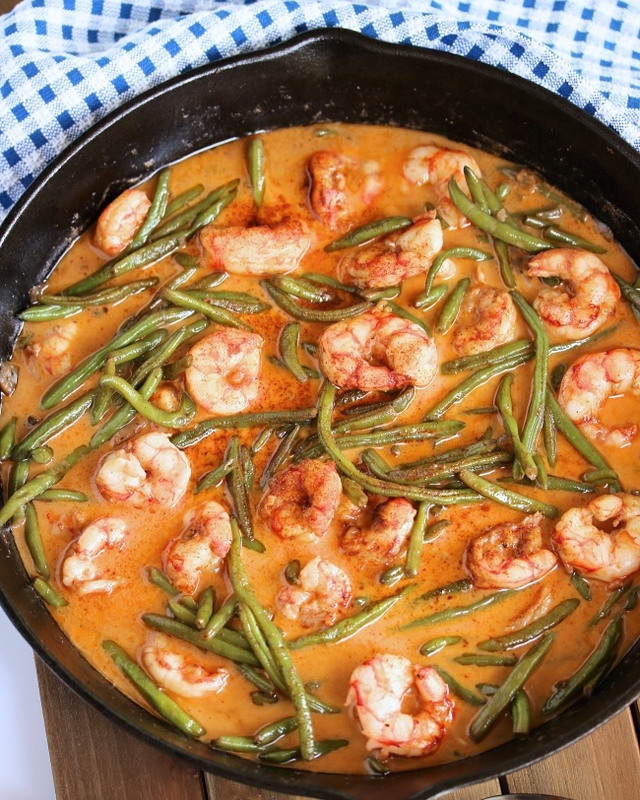 It will fill you up with juicy shrimp and tender-crisp green beans, and will warm your belly and senses with its mild, creamy curry base. While we love eating this on its own & drinking the remaining liquid, this is also an easy dish to bulk up with some cauliflower rice (for Paleo & Whole30 eaters) or white rice (for others who go for grains). I hope you love this meal! Feel free to add whatever other spices you enjoy and have on hand, or even toss in some pineapple or mango chunks for more flavor & texture. Use this quick & simple recipe as a guide, and enjoy! Melt the coconut oil in a large skillet over medium heat. Add the onion, jalapeño, and garlic, sautéing for 2 to 3 minutes to soften. Stir in the green beans, and sauté for 3 to 5 minutes or until tender-crisp. Add the spices, and stir to combine. 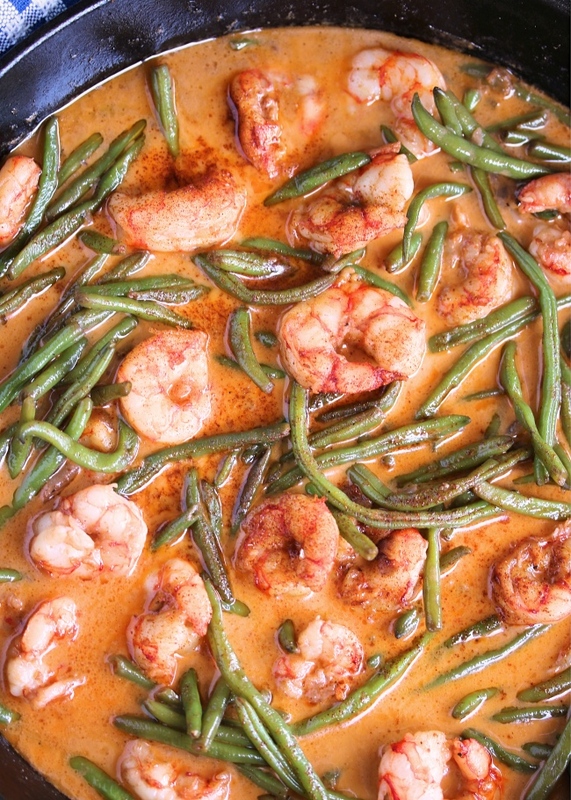 Move the green beans to the sides of the skillet, and add in the shrimp to the center. Cook for 2 minutes, then stir in the coconut milk. 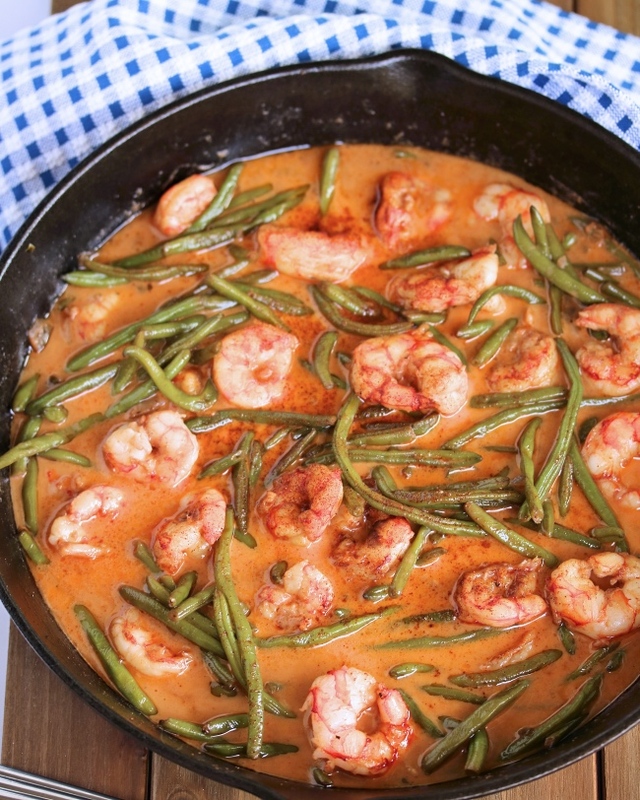 Simmer until the shrimp is cooked through, and the sauce slightly thickens. Serve alone or over steamed cauliflower rice (for Paleo/Whole30) or white rice (if you do grains). Enjoy!! This sounds delicious and I want to try it! It's called "curry skillet" but I don't see any curry on the recipe. Is that on purpose? Sorry if that's a dumb question. Thank you so much! Never a dumb question! :) "Curry" is a blend of spices. And I make my own simple Thai Curry spice blend which is what's listed in the recipe! It's so good!! Looks delicious! Do you use frozen green beans for this?